Open 24 hours a day - 7 days a week with special hours on Thanksgiving, Christmas and New Years. My Hy-Vee-East is much more than a grocery store. It fills the needs of the North Iowa community with quality products, meats and produce. The Deli, along with the Chinese Express, Italian Express, Sushi, and Salad Bar is first-class and fills a need in the community. You will see the catering trucks in all areas of the community setting up for special events! The Floral Shop carries a wide variety of beautiful floral and makes deliveries throughout the community. Wine & Spirits is fully stocked and has knowledgeable staff to find the appropriate beverage for your function. The Pharmacy, along with the Hy-Vee dieticians can help with your health and well-being concerns. Your Hy-Vee fuel saver card can be used at over 1,200 fuel stations. 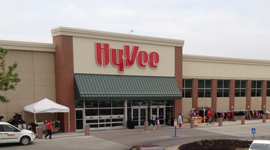 Hy-Vee is definitely a community partner, hosting and sponsoring various events in the community!